Welcome to the November issue of COPE Digest. My initial introduction to COPE many years ago occurred when, as an editor of a peer reviewed journal, a reviewer called to my attention a blatant example of fabrication in a manuscript in which years and volumes of references had been altered to make them more current. I contacted COPE, presented the case at a Forum, and received excellent advice and consultation. This ultimately resulted in numerous retractions of manuscripts published by this researcher, across three journals. A university office of research integrity became involved since the published papers involved falsified research results in government funded studies. Read the full article to understand what this means for your journal, with links to resources, cases, guidelines on retractions and discussion on expressions of concern. Researchers know that an accurate and detailed record is an essential part of their research project. But when problems arise with respect to collecting, maintaining, or storing research data, many researchers cannot tell you what to do or who to contact. Proper data management is particularly important if the credibility of research results are questioned and journal editors become involved in correcting the research record. Correcting the published scientific record in cases of research misconduct can be tricky to say the least. One thing that shouldn’t be so tricky is identifying the right person to contact at the involved institutions. The recently incorporated Association of Research Integrity Officers (ARIO) in the United States is working to ensure that finding the right institutional contact is the easy part of this often challenging process of dealing with potential research misconduct or research integrity concerns. 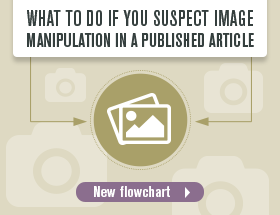 A reader expresses suspicion of image manipulation and you're not sure what to do next. This flowchart is a step by step guide, with links to useful tools. What signs might indicate authorship problems? 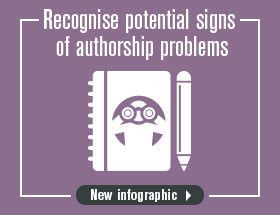 This infographic gives us the answer, together with best practice to minimise authorship problems. When you see an individual or group repeatedly using dishonest or fraudulent practices what should you do? 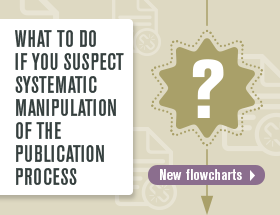 With a definition of systematic manipulation, these two flowcharts will guide you if you suspect manipulation either before or after publication. 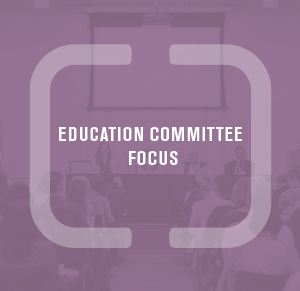 COPE Council members have gathered news this month on various topics with a keen eye on Post-Publication Discussions and Corrections, our Core Practice of the month. Analysis of the Retraction Watch database of 18,000 articles and conference papers which have been retracted since the 1970s. The Chinese government has proposed a blacklist of journals to deter researchers from misconduct. It has not released its selection criteria as yet. 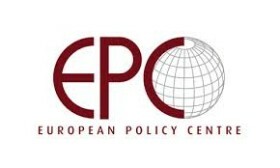 Vlaeminck and Podkrajac examine whether economics journals enforce their data policies. Their analysis of papers published in 2013 and 2014 found that not many did at that point. We are pleased to welcome four new members to COPE Council: Laura Wilson, Dr Daoxin Yin, Tim Devinney and Gavin Swanson. We are also delighted that Adrian Ziderman is to continue as a Council member for a second term. Read more about our new Council members on the COPE website. 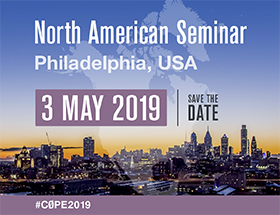 COPE Council member Mirjam Curno has been invited to participate in the discussion "Developing an ethical framework for non-medical sciences". This is the first discussion within the framework of the PRO-RES project. ISMPP are offering 10% discount for COPE members. The theme is "Scientific Communications in a Fast-Paced World: Fighting Fit for the Future". COPE is delighted to contribute to the programme of the 6th World Conference on Research Integrity, "New Challenges for Research Integrity". COPE Council member Iria del Rio shares her experience of the #METM18 conference where she delivered the keynote speech 'Credit and merit: toward a transparent, ethical publishing culture' and presented a COPE workshop, delving into COPE cases. Read Iria's blog post. You are receiving this email because you or your journal is a member of COPE or you have subscribed to COPE emails.